Our arrival in Budapest, Hungary marked our return to western civilization and the beginning of our two months in Europe. After spending four months in Asia, it was amazing to be able to walk into a café and grab a decent cup of coffee or a pint of beer. Budapest was an incredible city and we began our experience with a walking tour from “Pest” to “Buda”. 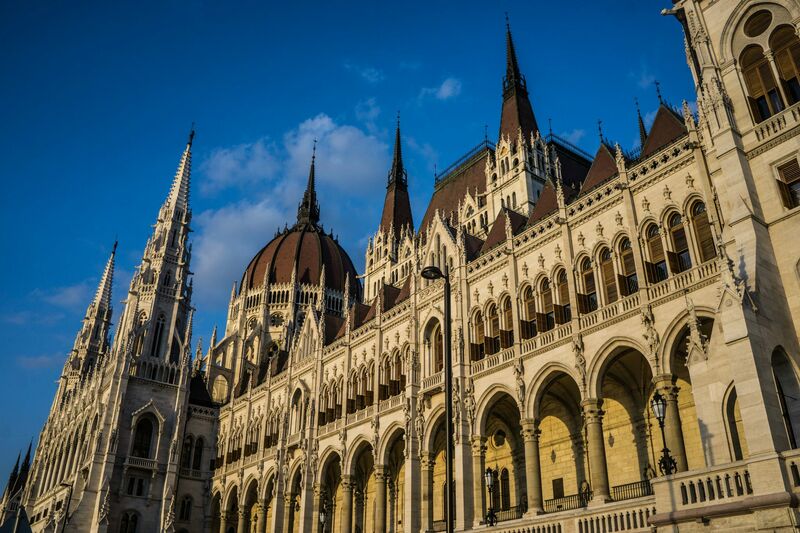 Yes, Budapest may actually be categorized as two distinct areas with one city. The Danube River cuts through the heart of city with Buda on the western side and Pest on the bank opposite. Buda is the site of a grand palace and seems to boast more of the wealth of the city. In contrast, populous Pest is where the latest and greatest of bars, cafés and gourmet restaurants may be found. We stayed at an Airbnb in Pest and truly felt like locals, frequenting the mini markets and bakeries for early morning sweet treats. 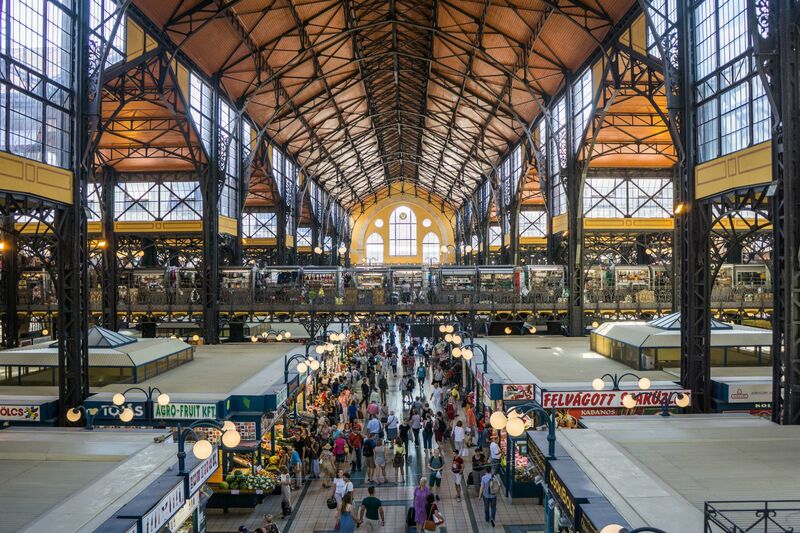 The Great Market Hall of Budapest, Hungary. Would you like paprika with your paprika? 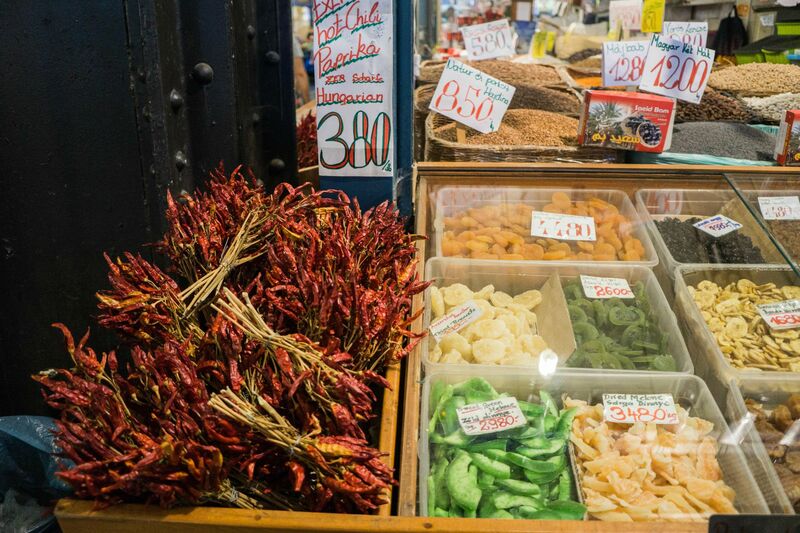 Our favorite activities in Budapest were running along the Danube, feasting on the rich cuisine (beef goulash and a cold beer, mmm), touring the Great Market Hall (we had no idea how much they LOVE paprika), and bathing with locals at the thermal bathhouses. For our thermal bath visit we opted to stay on the Pest side of town and visited the nearby “Széchenyi Baths” where you can still find old men playing chess, half immersed in the water. After Budapest we made a brief detour through Western Europe (Greece and Italy) before arriving in Krakow. Although we loved our time in Greece and Italy, especially given the autumn weather, the trade-off was that it was now that much colder (and rainier) in Eastern Europe. Although much colder and wet, we still enjoyed our time in Krakow and Prague. Krakow was the base for one of the most memorable day trips we’ve had – a full-day excursion to the former Auschwitz concentration camp. The tour took us via bus from Krakow to the camps where we visited both Auschwitz I and II (Birkenau) camps. It was a powerful and very moving visit. Two numbers will forever stick with me: 6 million and 70%. 6 millions people died in concentration camps. 70% of those that died were killed upon arrival due to their perceived physical inabilities (meaning mostly women and children). It was a day that I will never forget. For a total cost of 12 Euros we took the Polskibus from Krakow to Prague. 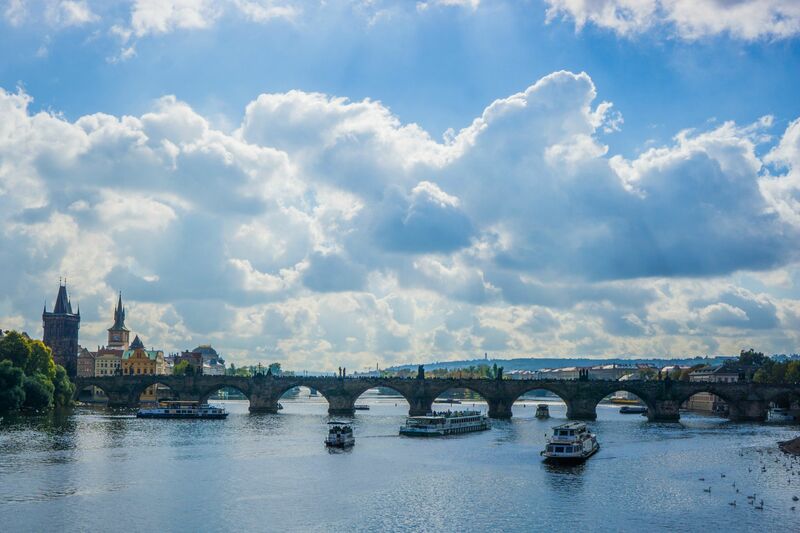 Of the three cities we visited in Eastern Europe, Prague had the most familiar and international influence. It was fun bouncing around the city and exploring both the new world to old world over the course of a few blocks. We most enjoyed catching an opera show (Nightingale) at one of the oldest opera houses in the world – the National Theatre of Prague.